Basically, all you have to do is join Sprint and sign up for a total of five lines of services under an Unlimited Basic Plan. Interested parties will then have to pay $60 per month for the first line, $40 for the second line, while the remaining three lines come free of charge. This translates into paying $20 for each line. But keep in mind that these rates will be available only until January 2020. 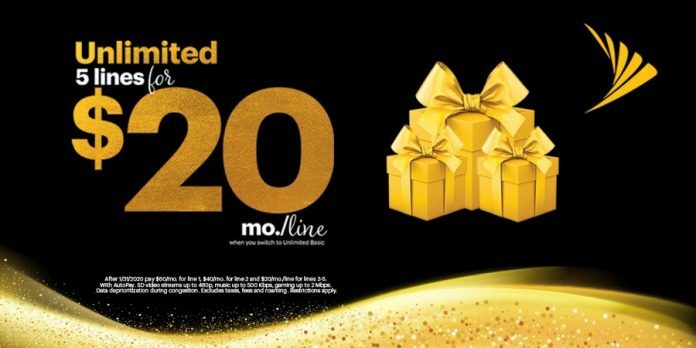 After the date, customers who previously took advantage of the promotion will be required to pay $60 for the first line, $40 for the second line and $20 for lines three through five. In case you don’t know, Sprint’s Unlimited Basic plan includes a Hulu Limited Commercials subscription, as well as the ability to stream in SD (DVD-quality), 500MB Mobile Hotspot, unlimited talk and text and 5GB of 4G LTE data in Mexico and Canada, global roaming in more than 200 destinations and unlimited data, talk and text nationwide. Last but not least, keep in mind that customers can add HD streaming on the plan for an additional $10/month per line. Sprint claims this promotion – which is available for a limited time only – will allow switchers to save more than $1,000 during the first year over at Verizon or AT&T. So if you think Sprint’s offer might be for you, don’t hesitate to take advantage of the promotion while it’s still hot. In related news, Sprint offers a series of other discounts in time for the holidays. For example, you can save up $250 instantly if you buy the Samsung Galaxy S9 or Galaxy S9+.